This is a new type of AudioStream that can be put in the regular stream players (normal, 2D and 3D): AudioStreamGenerator. Just put it anywhere and then get the Playback object, in this case AudioStreamGeneratorPlayback. Once this object is obtained, push stereo audio frames to it. You can do this by supplying Vector2 objects via buffers or individual audio frames. From GDScript, it's simpler to push individual frames (though less efficient). GDNative and C# allow pushing buffers. Just call this function before AudioStreamPlayer.play() (to ensure buffer is full before playback begins), and then call it from _process(), to ensure it remains full. This instance synchronizes with the audio playback, so the magnitudes of the frequency ranges should be exactly what is playing right now (or as close as possible). This uses Fast Fourier Transform, so you can change the buffer size to a smaller one for more accurate timing (but less accurate frequency information). This returns a normalized value in linear scale (DC at 0, saturation at 1). 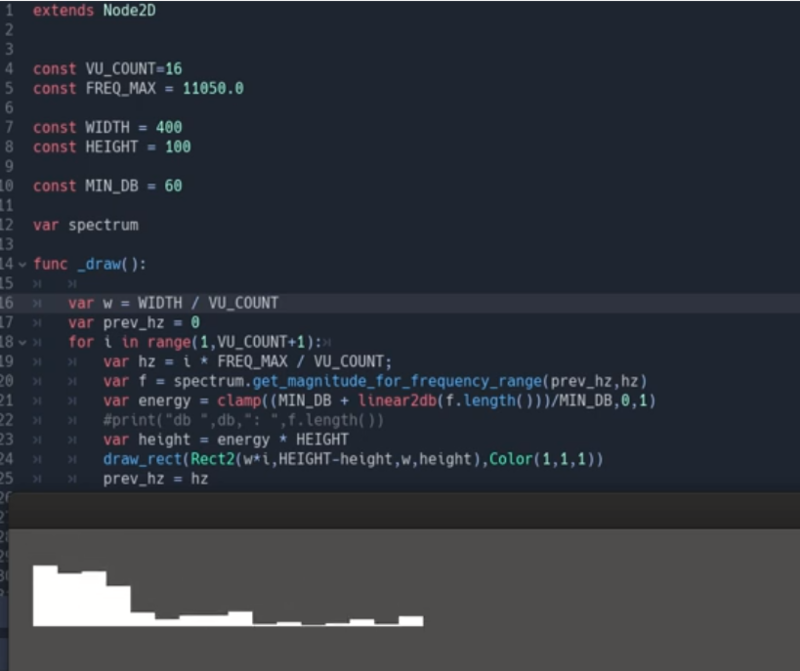 Use the linear2db() helper to convert to Decibels if needed. Example code for both projects can be found in the demo repository. I wanted to add a BPM detector for rhythm games, but all the open source code I found is GPL (incompatible with Godot MIT), so we will probably need to roll our own. I am too busy for this at the time, but if you want to help contribute to one, let me know (I can lend a hand explaining how it's done). As mentioned before, this month I will be working in adding missing features for Godot 3.2. Next month I will start the Vulkan port. If you are not yet, please consider becoming our patron. It's easy, and you help the project enormously, even if just a small donation.